Last week we were in Odessa for a seminar that my husband presented. I thought I'd share some pictures with you. Odessa is a very European looking city, much like St. Petersburg. It's located on the northern shore of the Black Sea, but is more of a port city than a tourist city. Therefore, the coast line is filled with more shipping industries than beaches. Like St. Petersburg, it was under Soviet control from 1920s until the early 1990s. Much of the downtown area has been restored since freedom came to Odessa. We didn't visit during summer, but I can tell it will be beautiful when the trees and flowers are out in full force. A very unique monument is located in a central park of the city, a chair sitting on a pedestal. It represents one of the chairs from a novel titled "12 Chairs" by a famous Odessan author. The story is about jewelry, hidden from the Bolsheviks, in the seat of a chair in a dining room set. The chairs were then stolen by the communists after the Russian Revolution. One person searches for all the chairs to find the hidden treasure. The twelfth chair was found in Odessa. The monument is a favorite place to pose for a picture in this park. We ate at a restaurant in which the Ukrainian culture was featured. Odessans have created a beach away from the industrial area. People were out enjoying the sunny day when we went to see it. The Black Sea was an amazing thing to see. It was so calm and peaceful that day. 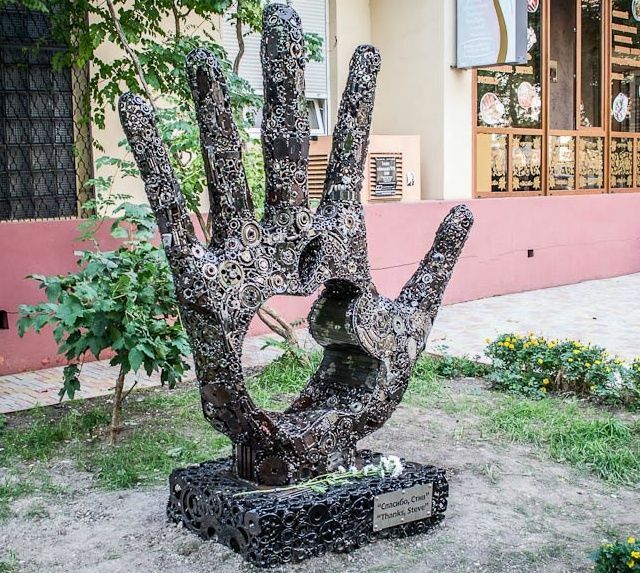 If you're ever in Odessa, don't forget to check out the monument to Steve Jobs. I was surprised to find this monument, built on the first anniversary of Steve Jobs death, located in a former Soviet country. This sculpture, made by a local craftsman, is constructed from scrap metal. It's more of a tribute to the Apple Company that Jobs started then Steve Jobs himself. This week I am taking time off from my usual postings about life in Russia. 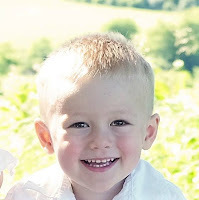 I'm going to ask you to pray for my grandson. His name is Christian, and he is having surgery to remove a tumor from his brain. When he was nine months old, he had meningitis. Thirteen months later, he had it again. The doctors finally did a scan of his brain to find out why he had meningitis twice before the age of two. They found he had an epidermoid brain tumor, which he's had since birth. The tumor is situated between his optical nerves and touching his pituitary gland. When the cyst expands with excess skin cells, it erupts leaking foreign cells into his brain, causing meningitis. After one week of living in St. Petersburg, we were able to move into our new apartment which is in a twenty-one floor high rise building. Thankfully, we live on the third floor so we don't have to wait forever for the elevator to get to our floor. We love it here because it's very new, bright, and close to the metro that my husband will use to go to teach this fall. The apartment is very spacious - by European standards - with a living room, bedroom, kitchen, bathroom, and WC. It was furnished with a couch, bed, table, chairs, and even a big screen TV. That saved us LOTS of money! We have a view of a river out of our bedroom window - maybe not a great view, but at least it's not another high rise staring at us. There is construction on both sides of the water, but that's OK for us. Our apartment is a mess once again. We've emptied out our personal possessions that need to go with us. We've managed to jam everything into our seven suitcases. By the time you read this, we'll already be in our new city - St. Petersburg, Russia. My husband will be teaching at the Ingrian Lutheran Seminary in a town close to St. Petersburg. He is excited about getting back into the classroom where he'll be teaching young men who are studying to be pastors in their church. Guide Me Home is Available on Amazon.com Buy a Copy Today! Click on photo to purchase your copy today!